While in town for another event, I visited the Portland Japanese Garden to view a tea ceremony demonstration at their tea house. 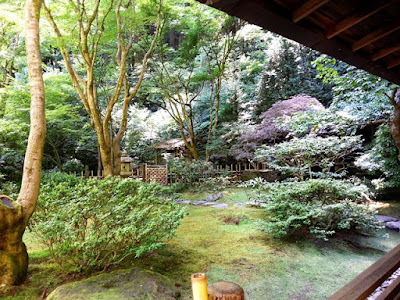 Kashintei (Flower-Heart) Tea House is located in the Northeast portion of the Portland Japanese Garden. The tea house was constructed in Japan and dedicated in 1968. 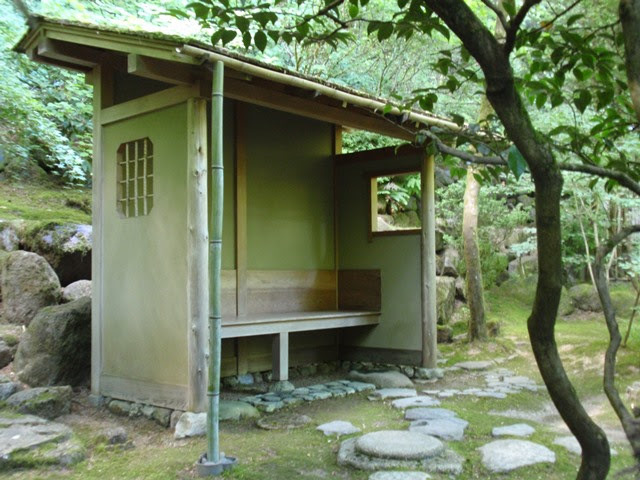 The tea house design was inspired by other demonstration-style tea houses in Japan, so the sliding shoji walls and slate floor entry are unique to this style of tea house. 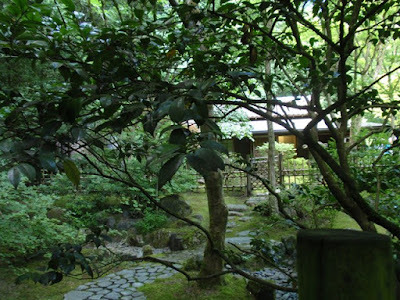 Upon entering the tea garden gate, the roji (path) winds its way to the tea house. On the way, guests will stop to rest in the machiai (sheltered waiting area) to await the signal that the tea ceremony will begin. The zashiki (tea room) is the main room where tea ceremony takes place. To the back of the zashiki is the door to the mizuya (kitchen) where everything will be arranged and prepared to carry out to the zashiki. Guests will remove their footwear before sliding into the tea room. 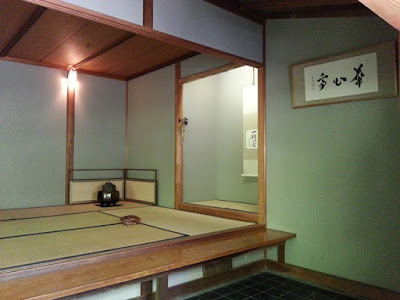 Traditional tea houses have a small opening that would require guests to slide into rather than walk into the zashiki. This is to allow the guests to symbolically leave their worldly concerns outside the tea house, casting aside their status and meeting as equals. 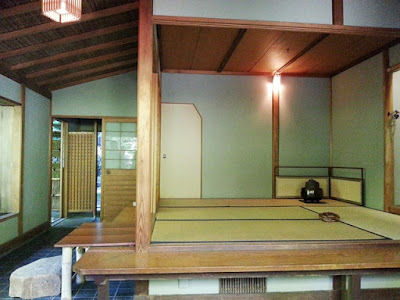 With this demonstration-style tea house, guests will still kneel and slide in as though the small entrance was still in place. Before taking their seat, the guest will stop to to view the tokonoma (alcove) where a scroll and flowers are displayed. The scroll usually features calligraphy of a poem or quote and for this event it was "Ichi-go ichi-e" (one time, one meeting), a famous quote often referenced in tea ceremony. It basically means that this moment must be treasured as it will never happen again exactly as it does this day. People will change, seasons will change, life moves on, and this moment must be treated as a unique and special occasion. With so many visitors wanting to see and learn more about tea ceremony, and with the sun shining down on the beautiful, cloudless day, I was unable to get close enough and out of the sunlight enough to take good photos of the event. Under those circumstances, I certainly can't complain. Please refer to the Japanese Garden's Events page for upcoming Chado (Tea Ceremony) dates.